Home GoRetro milestones Happy Fourth! 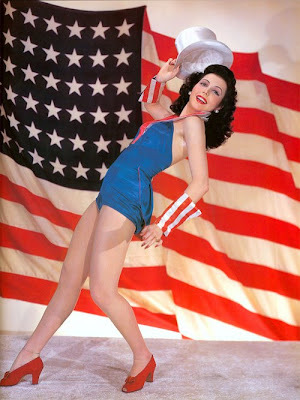 I'd like to wish all of my American readers a very happy and safe Fourth of July, full of pomp, parades, and hotdogs! You know, this month marks a special anniversary for the blog--it's now been going strong for five years. It's hard for me to believe since the time definitely passed by in the wink of an eye. So, to celebrate this milestone and to thank my readers and fans for their patronage, I'll be doing a giveaway next week. It's nothing earth shattering, but it is a nice item to win (hint: especially for foodies) so stay tuned. Hope everyone stays cool and safe today! 5 years and going strong! Happy 4th and happy blogversary! Hope that you had a nice 4th and that you have been doing well these days. Happy anniversary! You've done such a great job of giving us wonderful posts so far and I'm looking forward to enjoying more of them. I do have a bit of catching up to do as I haven't been on the computer much for a while. I am glad to hear that you now are able to watch American Pickers on TV. We just got Fios a few months ago too. I keep forgetting that you can DVR 2 things at once so I have't been taping that show but hopefully will catch reruns of them.